It’s time to break the topic habit, the temptation to think of content marketing in terms of individual projects – like blog posts. More traffic – Each post builds anticipation for the next in the series. In addition, each post drives traffic to the previous posts because those discovering the series will want to get caught up. Greater productivity – The series approach reduces uncertainty and helps you make the most of your writing time. (It’s generally acknowledged that the hardest part of most projects is getting started.) A series approach eliminates the stress of simultaneously trying to choose a topic and write about it at the last minute. Enhanced creativity – Choosing topics in advance triggers your brain. Once you have identified the topic about which you’re going to write, your brain will be busy processing ideas and making connections — even while you’re driving or sleeping. As a result, when you sit down to write, your brain often has fresh ideas waiting in the wings. Progressive disclosure – You can go deeper into topics without risking content overload that can result when you share too much information in a single post. Higher conversions and profits – Series are flexible and easy to adapt to your goals, whether their purpose is brand building, list building, lead generation, or creating continuity products that generate recurring revenue. Another major benefit of the series approach is that it solves the problem of “high-potential ideas” that might, otherwise, never see the light of day. How often have you come up with an idea that’s too big and too important for a single blog post, but you’re not ready to write a book? The frustration I was experiencing with “unwritten books” was the catalyst to this short series approach. I lacked a framework for action to help me develop and share my ideas at a consistent and sustainable pace. I lacked a vision or plan for creating a high-value, high-visibility project – or goal – greater than the sum of the original content. If you don’t have time to write a book, consider a short series as the next best way to leverage your ideas and expertise into leads, traffic, and profits. The short series approach offers a final compelling benefit: It provides an easy transition from the “no documented marketing plan or editorial calendar” situation that continues to undermine the success of many B2B, B2C, small business, and nonprofit content marketers. Trying the short series approach described and discovering its advantages can open the door to your firm’s adoption of more effective, long-term content marketing strategies for 2016. Blog post 1 – Introduce your idea and share its relevance. Consider describing the context in a problem-solution format. Describe the information you will share and how readers will benefit. In addition, summarize the seven core ideas or steps that you’ll be sharing in greater detail in the following posts. 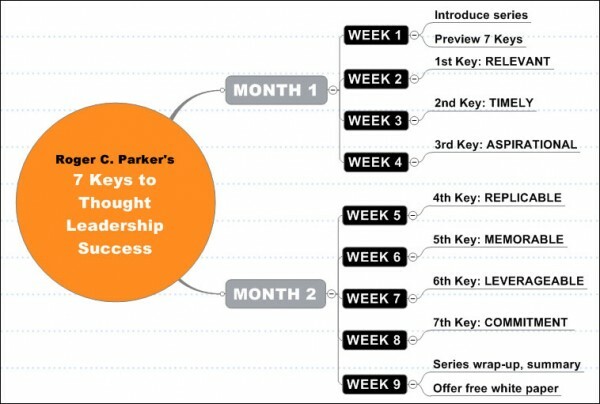 Choose a series title that identifies a problem and describe the solution using terms such as basics, keys, essentials, habits, hacks, mistakes to avoid, success factors, or things to look for. Blog posts 2-8 – Devote each of the next seven posts to one of the seven ideas you introduced in the first blog post. Blog post 9. In the final blog post, summarize the importance of the information you shared and the role that each of the seven posts plays in a successful outcome. Conclude with a call to action, such as a white paper download or webinar invitation. Or use the call to action in the last post to promote the launch of an e-book, video training series, or any new product or service. By the way, there’s no magic to developing a big idea in a nine-post series. I wanted the time and space to do justice to each of the seven ideas. A four- or five-post series didn’t offer enough opportunity to develop each point. A shorter series also would have reduced the time available to prepare the series finale’s call to action – the e-book, white paper, or training videos. I also had doubts about a longer series. I wanted a goal I could reach in a reasonable time. And, I was concerned that reader fatigue might set in with a three- or four-month project. Although I envisioned the project as a series of weekly blog posts which would appear on the same day of the week, this doesn’t prevent you from addressing other topics in between the installments of your short series. It’s essential, though, that your series updates appear at predictable intervals. You can download and study PDFs of the empty short-series framework (above), and the filled in short-series example (below). Look for a resonant problem or goal where you can make a significant contribution that will be appreciated by your ideal clients and prospects. Be guided by buyer personas and your ongoing conversations with different market segments. You can review the ideas you’ve been tracking in your content marketing idea dashboard. Choose a series title that clearly identifies the topic you’re addressing but also unifies the series and indicates progress (e.g., 7 Ways to Boost Conversions: Part 3 — Landing Pages.) 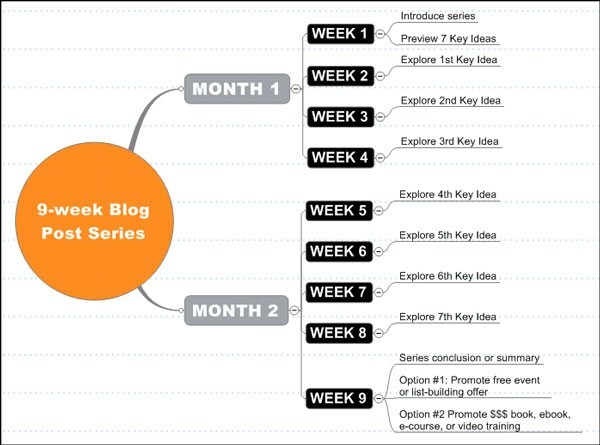 Most important, have a good idea of how you are going to develop each of the blog posts in the series. 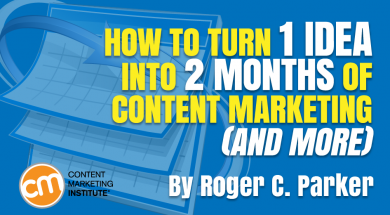 Create a consistent content structure. Avoid reinventing the wheel for blog posts 2 through 8. Instead, introduce each post by describing the current topic, its chief characteristics, and how it contributes to solving the problem identified in the first blog post. Decide what types of examples, quotes, or visuals will best tell your story. Look for ways to subtly reference previous posts in the series. At the end of each post, decide how you’re going to preview the next installment. Rather than starting with planning and writing the blog posts, define the series goal and the call to action at the series conclusion. What is the big picture in terms of the results you want the series to produce? Ask questions like: Will the goal be a list-building incentive, like a SlideShare presentation or a white paper? Is it going to be an event, like a webinar? Or will it be an e-book or video training series? Time management plays a crucial role in the success of your short series. Adding start dates and due dates to each blog post will help you keep the individual posts and call-to-action project on schedule for the grand finale. Be flexible, but consistent. Although it may be convenient to think in terms of weekly blog posts, don’t limit options. If necessary, you might want to schedule updates to every two weeks or once a month. If resources permit, update your series on a twice-a-week basis. Be influenced by available resources, but be consistent once you start. Use the series as a relationship builder. Look for ways to use the series to reward your followers and best clients. Identify how to offer premium content, greater-depth bonus information to your followers and key clients/prospects via password-protected pages. Offer electronic incentives like interviews, video content like screencasts, or downloadable checklists and worksheets to accompany the series. Announce these via email or social media. Write to discover. Don’t wait until you know exactly what you’re going to describe in blog posts 2 through 8 before you start to write. As long as you know the main points you want to share in each post, and have scheduled enough time to describe what you know, and know where to look for missing information, you’re likely to be surprised how well each post comes out. Use the right planning and project-management tools. Although you can create your version of the short series as shown earlier using a white board or spreadsheet software, visual tools offer significant advantages. I created the examples shown above with Mindjet’s MindManager mapping software. It allows you to develop the contents of each blog post, add starting dates and deadlines, as well as track each post’s traffic, referrals, and conversions. See How to Organize Your Blog Posts With a 3-Step Post Tracker. Repeat the process. The short-series approach is not a use-once-and-forget idea. After you’ve gone through the process for the first time, you’ll find it easier to repeat it with other ideas. You might consider scheduling a short series once a quarter in your own blog. Or you might experiment with a different short series on LinkedIn’s Pulse or a series of guest posts. Are you ready to schedule a short series to help you become a more consistent blogger while turning your big ideas into equity projects like e-books, white papers, and podcasts? Have you ever tried a short series approach to blogging? What are the key benefits the short series offers you? Are there any concerns or questions holding you back? Share your comments and suggestions. Want to uncover the unique story your brand was meant to tell? Download CMI’s Launch Your Own Content Marketing Program for step-by-step guidance.